This video shows Johnny and Andy on Kilimanjaro summit night. The video starts with the traditional 11:30pm tea wake up call and follows the boys through the dark as they ascend up to Stella point (5,752m) and then Uhuru peak – the Roof of Africa – at 5,895m. 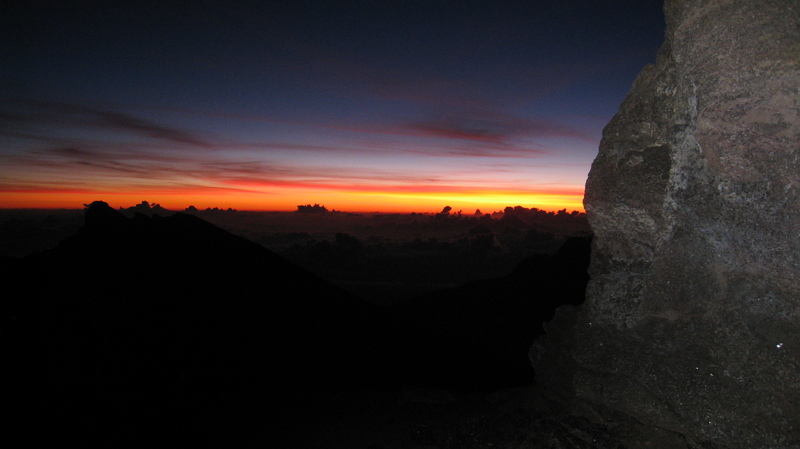 Many aspiring climbers don’t know that when you summit on Kilimanjaro you begin your ascent at night. Ascent to the summit is either made from the Southern camp called Barafu up the slopes of Kibo to Stella Point, and then west around the crater rim to Uhuru Peak, or from the Eastern side camp called Kibo Hut up to Gilman’s Point and then west around the crater to Uhuru Peak. Some people also use the technically challenging Western Breach to reach Kilimanjaro’s summit. Have a look at this Kilimanjaro Map to get a sense of the different Kilimanjaro summit approaches. Typically you arrive at base camp (i.e Barafu Camp or Kibo Hut) at around 15:00 or 16:00 in the afternoon. You will have something to eat, which is important as you will need the energy. Many people suffer from the early symptoms of Acute Mountain Sickness when they get to base camp and therefore don’t want to eat. We highly recommend trying to get some food down you, as you will need the energy that night. 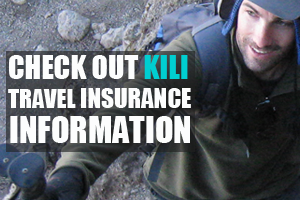 At around 18:00 you will start preparing your kit for the biggest trek of your life. It is important to get some shut eye because your guide will wake you at around 11:30pm to begin the summit attempt. 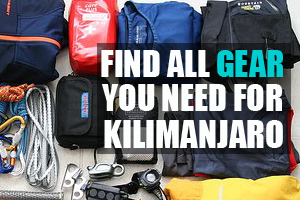 It is critical that you have the right equipment for Kilimanjaro summit night. The most important elements are of course your headlamp, very warm clothing and your walking poles. You can get a full overview of all the equipment you should have here. 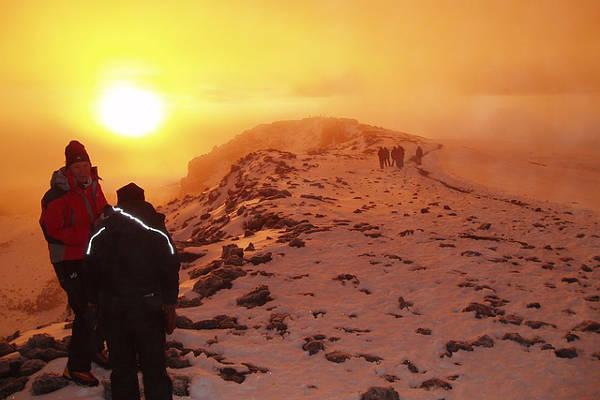 The Kilimanjaro summit night starts with a long and fairly steep climb on both approaches. The route winds which is good. It takes about 6 hours to reach Stella Point at 5,739 meters (a bit less to reach Gilman’s Point if you are using the eastern approach). Don’t get too excited when you see the Stella Point / Gilman’s Point sign. You haven’t yet reached the summit. 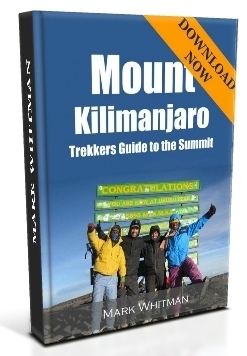 Many people believe they are at the top of Kilimanjaro, only to realise that they still have another 1-2 hours to trek. At both check points you will stop for a short break. Do not lie down or sit for too long as you might feel unable to carry on from this point. 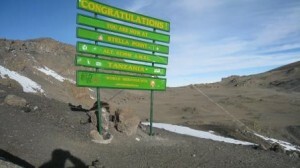 If you speak to most trekkers the final stretch on Kilimanjaro is one of will power. The slope is much more gradual from Stella / Gilman’s to Uhuru Peak (5,895m). Remember to stay positive and determined. Put one foot in front of the other and push on. The final push is tough but it is totally worth it. Reaching the summit as the sun rises and glistens off the glaciers that surround you is awe-inspiring.